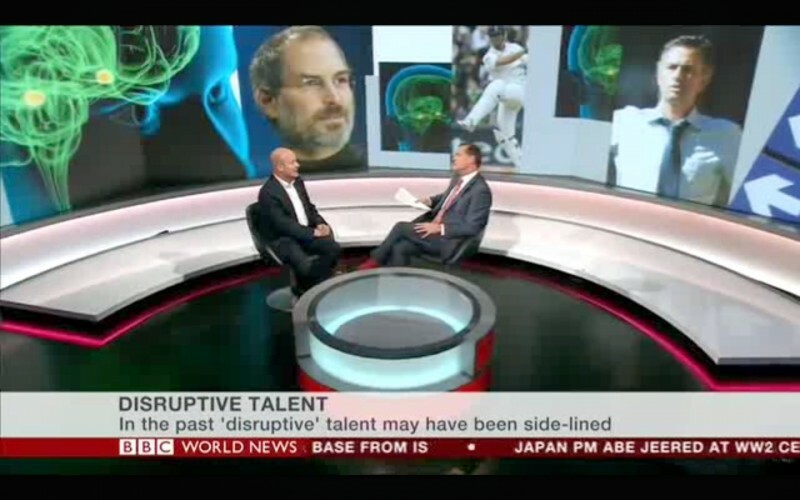 On Tuesday 23 June 2015, Martyn Sakol, Chartered Psychologist, MBA and Managing Partner of OE Cam talked to Aaron Heslehurst at BBC World News about ‘Disruptive Talent’. What is it and how can traditional organisations harness disruptive talent to drive innovation? ‘Disruptive Talent’ is a new proposition developed by OE Cam and is a term used to describe individuals who are brilliant but ‘challenging’. They innovate, challenge conventional wisdom and tenaciously find new and better ways to deliver business success. In the past they may have been side-lined due to their unusual approach or inability to function within a team, but now they are being recognised for their potential to revolutionise the firms in which they work. “We psychologically profile, we understand the personality of the individuals, we assess their competence and we take a view about whether they meet the criteria for disruptive talent. The way in which companies are experimenting with innovating through disruptive talent is by creating programmes so that those individuals are supported, and their derailers are anticipated and managed so they can drive new innovation“. For more information about disruptive talent programmes, please contact Martyn Sakol.